In a mixture of gases, each constituent gas has a partial pressure which is the notional pressure of that constituent gas if it alone occupied the entire volume of the original mixture at the same temperature. The total pressure of an ideal gas mixture is the sum of the partial pressures of the gases in the mixture. The partial pressure of a gas is a measure of thermodynamic activity of the gas's molecules. Gases dissolve, diffuse, and react according to their partial pressures, and not according to their concentrations in gas mixtures or liquids. This general property of gases is also true in chemical reactions of gases in biology. For example, the necessary amount of oxygen for human respiration, and the amount that is toxic, is set by the partial pressure of oxygen alone. This is true across a very wide range of different concentrations of oxygen present in various inhaled breathing gases or dissolved in blood. [clarification needed] The partial pressures of oxygen and carbon dioxide are important parameters in tests of arterial blood gases, but can also be measured in, for example, cerebrospinal fluid. The symbol for pressure is usually P or p which may use a subscript to identify the pressure, and gas species are also referred to by subscript. When combined these subscripts are applied recursively. Schematic showing the concept of Dalton's Law. The mole fraction of a gas component in a gas mixture is equal to the volumetric fraction of that component in a gas mixture. The partial volume of a particular gas in a mixture is the volume of one component of the gas mixture. It is useful in gas mixtures, e.g. air, to focus on one particular gas component, e.g. oxygen. Vapor pressure is the pressure of a vapor in equilibrium with its non-vapor phases (i.e., liquid or solid). Most often the term is used to describe a liquid's tendency to evaporate. It is a measure of the tendency of molecules and atoms to escape from a liquid or a solid. A liquid's atmospheric pressure boiling point corresponds to the temperature at which its vapor pressure is equal to the surrounding atmospheric pressure and it is often called the normal boiling point. The higher the vapor pressure of a liquid at a given temperature, the lower the normal boiling point of the liquid. The vapor pressure chart displayed has graphs of the vapor pressures versus temperatures for a variety of liquids. 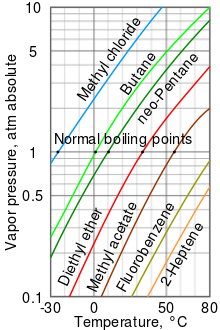 As can be seen in the chart, the liquids with the highest vapor pressures have the lowest normal boiling points. For example, at any given temperature, methyl chloride has the highest vapor pressure of any of the liquids in the chart. It also has the lowest normal boiling point (-24.2 °C), which is where the vapor pressure curve of methyl chloride (the blue line) intersects the horizontal pressure line of one atmosphere (atm) of absolute vapor pressure. Note that at higher altitudes, the atmospheric pressure is less than that at sea level, so boiling points of liquids are reduced. At the top of Mount Everest, the atmospheric pressure is approximately 0.333 atm, so by using the graph, the boiling point of Diethyl ether would be approximately 7.5 °C versus 34.6 °C at sea level (1 atm). For reversible reactions, changes in the total pressure, temperature or reactant concentrations will shift the equilibrium so as to favor either the right or left side of the reaction in accordance with Le Chatelier's Principle. However, the reaction kinetics may either oppose or enhance the equilibrium shift. In some cases, the reaction kinetics may be the overriding factor to consider. is quite often referred to as the Henry's law constant.
. Since both may be referred to as the Henry's law constant, readers of the technical literature must be quite careful to note which version of the Henry's law equation is being used. Henry's law is an approximation that only applies for dilute, ideal solutions and for solutions where the liquid solvent does not react chemically with the gas being dissolved. In underwater diving the physiological effects of individual component gases of breathing gases is a function of partial pressure. The minimum safe lower limit for the partial pressures of oxygen in a gas mixture is 0.16 bars (16 kPa) absolute. Hypoxia and sudden unconsciousness becomes a problem with an oxygen partial pressure of less than 0.16 bar absolute. Oxygen toxicity, involving convulsions, becomes a problem when oxygen partial pressure is too high. The NOAA Diving Manual recommends a maximum single exposure of 45 minutes at 1.6 bar absolute, of 120 minutes at 1.5 bar absolute, of 150 minutes at 1.4 bar absolute, of 180 minutes at 1.3 bar absolute and of 210 minutes at 1.2 bar absolute. Oxygen toxicity becomes a risk when these oxygen partial pressures and exposures are exceeded. The partial pressure of oxygen determines the maximum operating depth of a gas mixture. Narcosis is a problem when breathing gases at high pressure. Typically, the maximum total partial pressure of narcotic gases used when planning for technical diving may be around 4.5 bar absolute, based on an equivalent narcotic depth of 35 metres (115 ft). The effect of a toxic contaminant such as carbon monoxide in breathing gas is also related to the partial pressure when breathed. A mixture which may be relatively safe at the surface could be dangerously toxic at the maximum depth of a dive, or a tolerable level of carbon dioxide in the breathing loop of a diving rebreather may become intolerable within seconds during descent when the partial pressure rapidly increases, and could lead to panic or incapacitation of the diver. ^ Charles Henrickson (2005). Chemistry. Cliffs Notes. ISBN 978-0-7645-7419-1. ^ "Gas Pressure and Respiration". Lumen Learning. ^ Frostberg State University's "General Chemistry Online"
^ Page 200 in: Medical biophysics. Flemming Cornelius. 6th Edition, 2008. ^ Francis L. Smith & Allan H. Harvey (September 2007). "Avoid Common Pitfalls When Using Henry's Law". CEP (Chemical Engineering Progress). ISSN 0360-7275. ^ a b Normal Reference Range Table Archived 2011-12-25 at the Wayback Machine from The University of Texas Southwestern Medical Center at Dallas. Used in Interactive Case Study Companion to Pathologic basis of disease.